Special Containment Procedures: Due to the nature of this object and the almost nonexistent harm it poses, it is stationed in a storage container in Site-19 with a standard lock. The red tub in which SCP-387 is contained does not possess any unusual properties itself, as has been determined through testing but SCP-387 will not duplicate itself unless at least a layer of it covers the bottom of the aforementioned container. A sheet is available for those wishing to utilize SCP-387, and access will be revoked if it is not properly restored. Description: SCP-387 is a tub of commercially available Lego, normal in design. Irregular shapes not featured in normal sets, such as circular “wheels,” and prisms, are also available. It has no brand name, and every company interviewed by undercover Agents thus far has denied ever making irregular Lego. When the tub is not full (i.e. when it is partially or almost-fully emptied) the Lego will slowly duplicate themselves, stopping when the container is full. The interesting property of SCP-387 is that, when constructed by a human hand (see Addendum 387-d) the constructions will animate themselves, performing activities based on their surroundings. For example, if a Legoman – which is a “man” constructed using the provided humanoid parts - is placed within a car, it will begin to drive it. Further experimentation has revealed that the car (and indeed, any complex machine) needs no internal engine or power source. The legopeople have some form of sentience, as they interact with each other quite readily. If left over time, the constructed people and buildings will evolve. They will take on occupations based on the buildings around them, (e.g. some people will become firemen and use firetrucks if the corresponding objects are there). They will also use SCP-387 to construct more things to expand their society. Humans can interact with them quite peacefully, but if a human becomes hostile to them, they will immediately cease all activity and become inanimate. SCP-387 was found in February of 20██ by Agent H████. During a long train ride back to the city he lived in, Agent H████ idly constructed a man from SCP-387 (which was in the seat beside him at the time). Several seconds later it became animated. Agent H████ quickly disassembled the man and delivered the item to Site-19 for analysis, where it now remains. The security tapes from the train were confiscated and destroyed before they could be reviewed. Optional information: SCP-387 should not be given to children under the age of 10, especially if the aforementioned children are influenced by cartoons and television shows. See Addendum 387-b. - Several Legomen procured some equipment from SCP-387, heading over towards the plane. - With incredible efficiency, the Legomen constructed what was, for all intents and purposes, a working airport, the specific pieces having been supplied by SCP-387, without visible signal. - A petrol tank zoomed over to said plane, apparently filled it with fuel (despite earlier observations that vehicles constructed from SCP-387 do not require fuel) and the plane proceeded to literally take off, flying around the room at low speeds and altitude, seemingly to avoid crashing. - More planes, of different make and design, were formed soon after. Experiment 387-b: Several young children were given SCP-387 and were given instructions to use their imagination. The children, who had their memories of this experiment removed, began constructing various objects. After having noticed that they were animate, they excitedly conferred, and began building several objects that they intended to use in battling each other. These included a Transformer, an M1 Abrams Tank and several [EXPUNGED] The children were instantly removed, at which point the creations began to fire and eventually destroyed each other, though not after considerable effort. 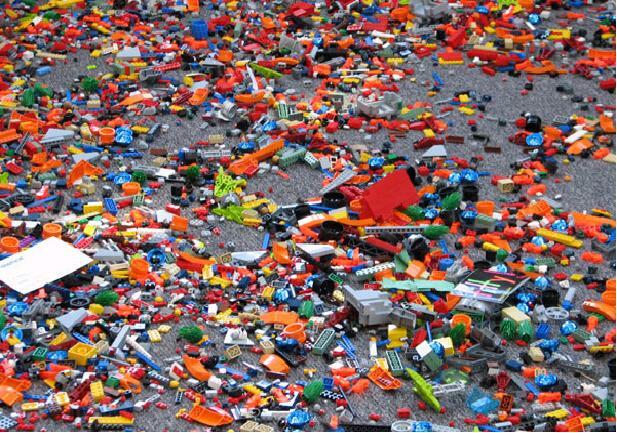 Experiment 387-c: The red tub that contains SCP-387 is emptied of Lego. Commercially available Lego is then placed in the tub for a minute. Constructed objects are inanimate, and remain so. SCP-387 replaced. It is noted that the Lego placed within the tub also did not duplicate itself. Experiment 387-c-2: A single block of SCP-387 is placed within the red tub. It does not replicate. More of SCP-387 is added until the bottom layer is covered, at which point it began to replicate itself quite rapidly until it had been filled. The amount of SCP-387 removed from the tub continued to work. Similarly, when an amount of SCP-387 higher than the tub’s capacity was placed upon the tub, it shrank until the red tub was fully filled. Experiment 387-d: A robotic arm was used to construct a car out of 387. It did not animate. This test was repeated with a human hand, at which point the car animated as usual. A dead hand from a recently-dismembered Agent was used, to no response. The hand was then heated, which still provoked no response.